What is an Avatar? It is your alter ego in Cyberspace, your body double in the virtual communities growing inside two and three dimensional virtual worlds online. 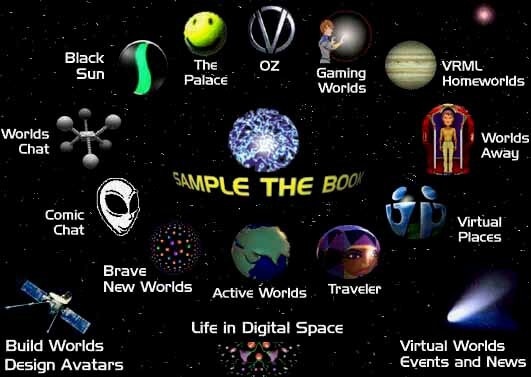 With the book Avatars and this companion website, you can now leave simple chat rooms behind and venture forth into the true frontiers of virtual world Cyberspace. IMVU - cool new avatars in an Instant Message world! Note that some of these worlds are from the period 1995-99 and are now offline, but we keep the Teleport up for historical purposes. For some continuing communities we invite you to visit Traveler, or Active Worlds, or Virtual Places, or The Palace, or Blaxxun Contact, or the Vzones and of course, the new kids on the block including Second Life, There and IMVU. New Life in Digital Space Sample the Book Online! The annual Contact Consortium Avatars conferences started with two physical conferences held in San Francisco of about 500 attendees each, Earth to Avatars in October 1996 and Avatars97 a year later. Thereafter we moved the conference "into Cyberspace" with the groundbreaking Avatars98. 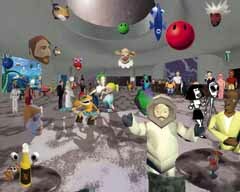 This conference series continued until early 2003 with the final event, Avatars2002, held in the Active Worlds platform. The entire archive of Avatars conference sites can be viewed here. What do you think about Avatars?, email author Bruce Damer directly! The entire electronic version of the book is now online here! Order used or new paper copies from this page at amazon.com or elsewhere online or in bookstores near you. Listen to a January 1998 Avatars Book Tour interview at Lets Talk Computers out of Nashville (in realaudio format). Since 1995 the author has presented virtual worlds at many conferences. There are extensive writings here by the author about virtual world cyberspace. Avatars! was recommended by amazon.com as a top Internet book in 1997 (note this page is no longer online). Original 1997-98 Book Tour Schedule. Other books about Avatars and virtual world cyberspace. Join DS-News and stay up to date on Avatar Cyberspace. Click here to see Avatar Bar Scene and other images from the book! Have a serious interest in Avatar Cyberspace? The Contact Consortium is a not for profit membership organization dedicated to the development of human contact, culture and community in on-line virtual worlds. Consortium members come together to hold conferences, on-line events, and support the projects of its special interest groups. If you want to know what is up in Avatar Cyberspace, join the Contact Consortium. The Digital Space Commons is a private company providing research, design, and consulting services for projects developing virtual worlds on the Internet. Digitalspace has unmatched expertise in applications of virtual worlds in science and education, collaborative workspaces for the enterprise, and worlds for entertainment. © 1996-2006 Bruce Damer, All Rights Reserved.